This is the Champion Helmets review of the French Modular helmet, the Roof Boxxer Carbon. 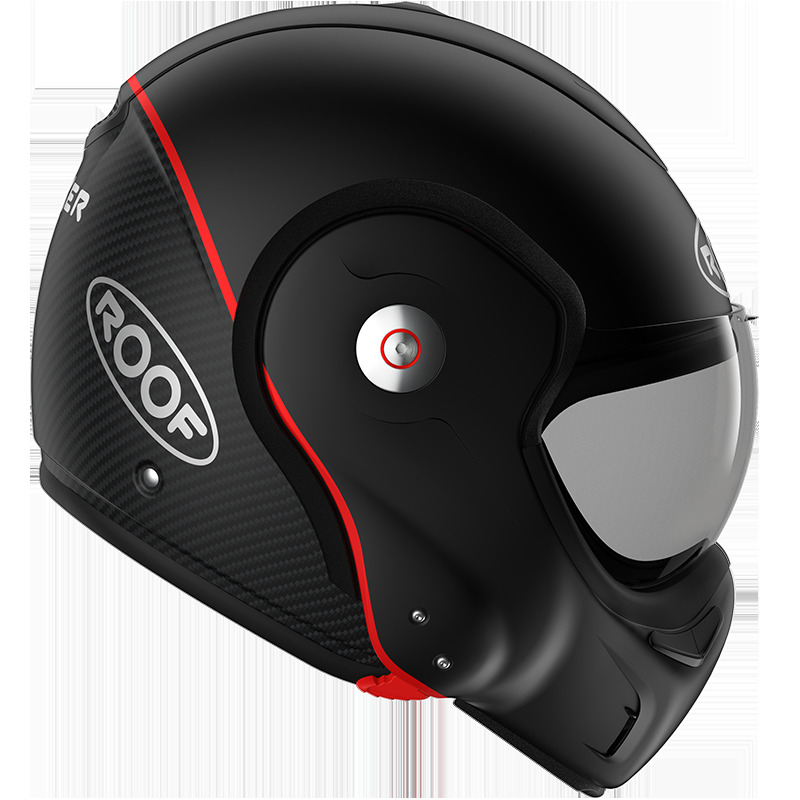 The Roof Boxxer Carbon is the flagship modular helmet of the French company, Roof. 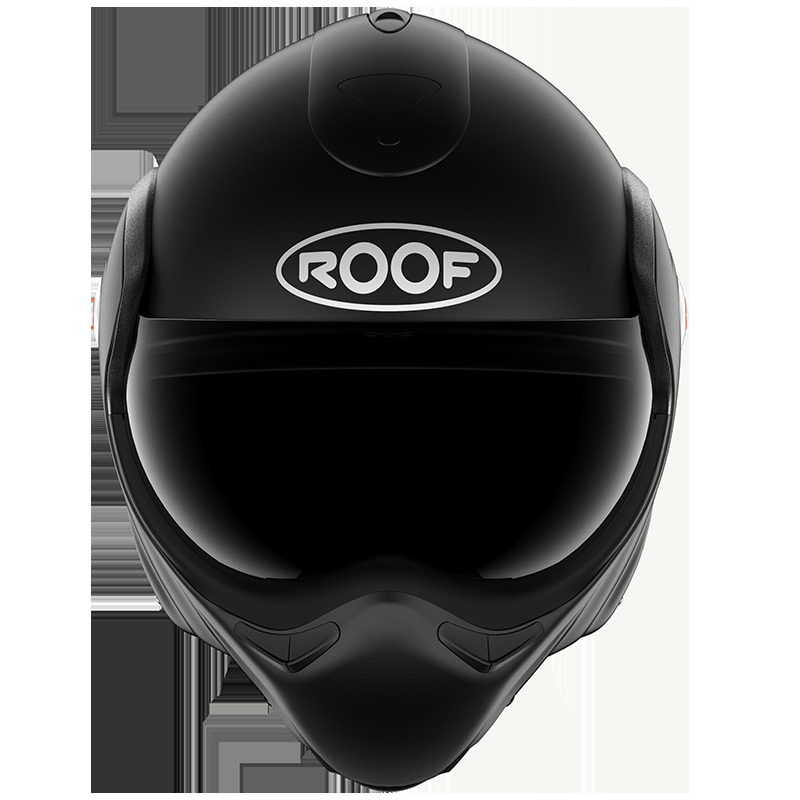 This helmet is a major evolution over the previous Roof Boxer V8 and there have been plenty of improvements. One of the major improvements with the new Boxxer is that they have managed to squeeze another x into the Boxxer name. They officially say that it’s because of the improvements they have made but the real question is just how much has that extra X added? The Boxxer Carbon is a modular helmet, made out of carbon fiber and fiberglass, hence the addition of carbon to the name. One of the major improvements has definitely been comfort for this helmet. It now weighs 1550 grams, which is about 200 less than the Boxer V8 and it’s pretty light for a modular helmet. For example, the Boxxers two closest competitors the HJC RPHA 90 and the Shark Evo One 2 weigh approximately 1470 and 1650 grams respectively. This places it solidly in between the competition. The helmet itself also comes in 7 different sizes, which is always a plus. The biggest changes to this helmet can be found around the chin and that is because it has a new automatic lock system. It is controlled using two toggles and can be opened by simply clicking them. They will also simply lock into position when the chin bar is closed. This is a quality of life improvement over the Roof Boxer V8. The chin bar also flips a full 180 degrees onto the back of the head and it will make you like either a Greek god, a horned bull or a devil, depending on your particular taste. This is a key feature of the Boxxer and something that really sets it apart from a lot of other modular helmets. By flipping 180 degrees you also reduce drag on the helmet. This helps a lot when riding in the open style and you will be able to feel less pull when you go a bit faster with a Boxxer over another opened, modular helmet. The visor is anti-scratch and anti-fog which does a pretty good job. We also have a promotion where you get a free visor when you buy at Champion Helmets. The Boxxer has clearly been upgraded to fit with the modern world of modular helmets. As with the chin bar, the visor seal has also been improved. It now comes with a silicon seal which conforms to the visor both when you close the chin bar, then visor and also when you pull the visor down before the chin bar. This is something nice and you won’t have to worry about following a set pattern when closing the chin bar like you did with the V8. It also helps with weather and sound proofing, though I think it is still better to first close the visor for the best seal. The ventilation has been reworked as well. On the chin bar we have 6 ventilation options and on the top we have one large vent, which will circulate air through the safety liner and out the back. Of course, for maximum ventilation we recommend that you open the chin bar all the way. Now for when you don’t want ventilation, the visor seal gets a big yes from me for keeping rain and wind out. The vents also do a good job of keeping you comfortable in uncomfortable weather. The neck curtain seals the helmet comfortably around your neck and it is obvious that they have tried to improve the comfort of the helmet. The chin bar, visor and ventilation got a big rework with the Boxxer as well. Everything soft on the inside is removable and washable which is always nice, plus underneath that we have space for a Bluetooth communication system. The Roof Boxxer is also now a bit more silent than the V8 but it still a pretty noisy helmet, especially if it’s opened… They tried to improve on this but it won’t be the quietest helmet out there. In terms of safety, the Boxxer Carbon has you pretty well covered whether you wear it as a full face or as an open helmet. It has been E22-05 certified in both positions so you’ll be legally covered cruising with this helmet even when it’s open. The chin strap got an upgrade too. It is now anchored to 4 points on the helmet shell to make it more stable on your head. Not a groundbreaking innovation but it’s a nice feature. The clips have also been redone in order to be more user friendly. Alright, now we have all that out of the way, lets talk about something a little less technical. The looks. I like it. Like I said earlier, if it’s open you look like you have wings on your head and it gives a kind of mythical feel. But when it’s closed it looks, astounding. I mean, I know it is a jet helmet but I love that look. Especially in the white color, this is probably my favorite looking modular helmet. Despite all of Roofs attempts to make a solid, perfect modular helmet, there are still some compromises when you pick up a Boxxer. First of all, the price. At about 530 Euro or 610 USD the Boxxer is not cheap. By comparison, the HJC RPHA 90 is around 550 USD and the Shark Evo-One 2 is about 380 USD without discounts. The Boxxer sits well above the competition in terms of price and looks but in terms of quality and comfort, the others are a little better. The sealing of the Boxxer is not as good as something like a Shoei Neotec II but then again, that helmet is in a higher price range. If you want something that is just comfortable and you don’t care for style, then the Boxxer may not be for you. Style and recognition are defiantly the advantages of the Boxxer but they have made some good improvements over the V8. Another problem for you could be that it is too unique outside Europe. You can struggle to find any forums or posts online about the Boxxer unless you speak a European language. That is mostly due to its success in Europe though and won’t be a problem unless you really like to discuss your helmets online. You could always learn French. I wouldn’t though, because it is a tough language. But if you want to show it off to your mates, then you might need to bring a brochure with you. Personally for me, the Boxxer would not be my first choice. For the price, I would probably go for the Shark Evo One 2 because I like the bargain elements of that helmets over the style focus of the Boxxer. That being said, I would have no problem using the Boxxer and on a good sale, I might even pick it up. It just doesn’t focus on the areas that I would want my helmet to focus on. We named the Roof Boxxer Carbon as one of our top modular helmet picks for 2018 and 2019. To find out more about this and exactly where the Roof Boxxer fits amoung other modular helmets, you can watch our Best Modular Helmet of 2018 - 2019 video. There are plenty of people out there that have questions about the Roof Boxxer Carbon as well. I have seen them, I have read them and I have picked some of the most common and relevant questions that were asked. For this we have the FAQ below. What kind of competitors does it have? So based on price point, there are 2 main competitors, the Shark Evo One 2 and the HJC RPHA 90. The main difference between these helmets, is that the Boxxer is more of a style choice. The others definitely look boring by comparison but they will be a bit better in comfort. Like I said earlier, the Boxxer looks better but is more expensive and not quite as comfortable. So Roof is a French company. They do a lot of business in Europe and this has been their main focus. So they are definitely going to be more unique and exclusive in America, Canada, Australia and New Zealand. Why should I buy the Boxxer? The main difference between the Boxxer and V8 is the going to be price versus comfort. Like I said before, the Boxxer has a lot of improvements over the V8 especially with the ventilation and chin bar locking system. The V8 is selling for like 1/3 less on the champion helmets website though. It is less refined but still a decent and stylish helmet. If you are really into the Roof designs then the added cost probably won’t be too big a factor for you though. Essentially, the Boxxer is more expensive but better. Yes, they are good quality. They are not cheap helmets. But for the price, there are going to be better quality helmets. They will do the job though and they are a big improvement over the V8. How much does the chin bar pull when opened? It will pull. All modular do when opened. This will make it a bit better but don’t expect this to work like a track day helmet when open. When riding faster, it is always better in the closed position. How much of a difference does the visor make? The difference will depend on how fast you ride. If are just cruising around at 50km/hour than you won’t be too bothered by it but when you decide to accelerate that is when it’ll be noticeable. Also going into a strong headwind will be somewhat easier as the wind will drag less. Typically it shouldn’t be that much of a difference but it will be more comfortable for you. Can I fit a pinlock visor? No, you cannot fit a pinlock visor but that should be ok because the visor has been anti fog treated. Unless you want to drill your own holes which I wouldn’t. 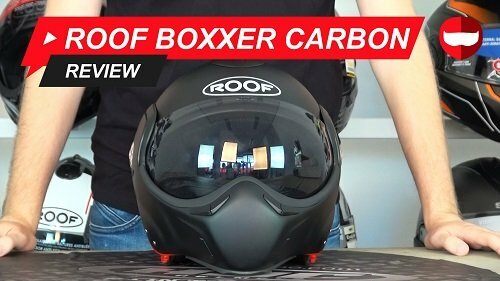 That was the Campion Helmets review for the Roof Boxxer Carbon and I also answered some questions that you guys asked us during and after the CH Live-store. I hope that you have found this to be helpful. 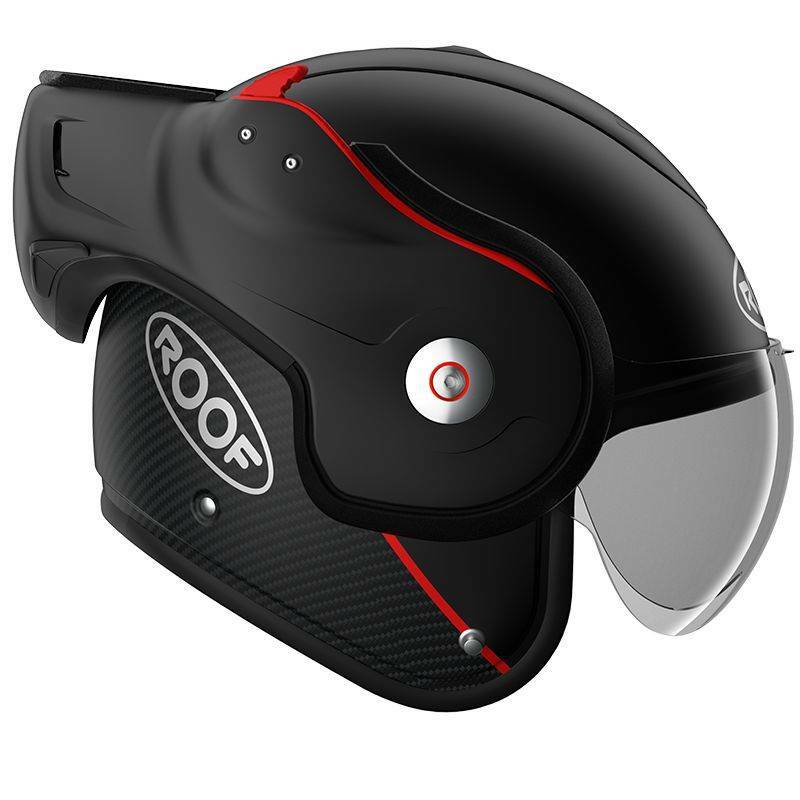 You can also view the video review that we made on our YouTube channel or on the product page of a Roof Boxxer helmet. Thanks for reading!